Your twenties – a golden decade? Your twenties are a golden decade – the time in your life when you’re free as a bird and blissfully happy. That’s the view of an Australian academic whose research hit the papers this week. The timing was particularly apt for me because a couple of days earlier I’d pitched up at a reunion with university friends I hadn’t clapped eyes on for thirty years. We’d all studied at the University of York and some of us hadn’t met since we were carefree, twenty-something students, unencumbered by children, partners and scary mortgages. But as we reminisced about wild parties by the river, the friend who drove his Beetle at high speed down the college corridors and a York University ski team comprising five crack skiers and a boy who’d never skied in his life but gamely agreed to give it a go, the years rolled back and we were all twenty again. Before I arrived at the party I’d been worried that I’d walk into the room, confront a sea of middle-aged faces (including my own) and not recognise a soul. People change an awful lot in thirty years, I thought. Hair turns grey, skin goes wrinkly and youthful hopes and dreams are replaced by the cold, hard reality of middle age. But I needn’t have worried. Everyone looked pretty much as I’d remembered – and no one had changed a jot in character. David was the one who’d stayed in touch with everyone and got us all back together, Nick and Paul were still the life and soul of the party, Pete was upbeat and generous-hearted and Sue was as glamorous as ever. No one had suddenly become pompous or boring or full of themselves. Everyone was chatty, effusive, full of great stories and brilliant company. I was extraordinarily pleased to see them all. I reckon that Australian academic got it just about right. PS. 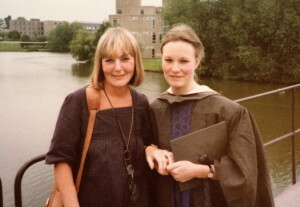 The picture is from my graduation day, with my wonderful, incredibly youthful mum. School reunions – heaven or hell?